The director of Guernsey Museums has called on people outside the States to help preserve and exhibit the Gallo-Roman wreck Asterix in the island. Dr Jason Monaghan said Asterix is the most historically valuable Roman artefact in northern Europe. He said a public private partnership could be the way forward. Dr Monaghan said: "It's a very exciting idea, but Guernsey is actually quite a small place and maritime archaeology projects are expensive." He said: "What we're saying at the moment is the ship is ready we want people now who are interested in helping secure the future of the ship to step forward and to start the discussion of where it's going to go, how we're going to fund it coming here." The wreck was found on Christmas Day 1982 in St Peter Port Harbour and raised by the Guernsey Maritime Trust during 1984-86. 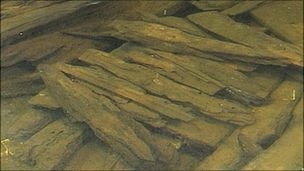 Since then it has undergone restoration work at the Mary Rose Trust in Portsmouth, costing the States £5,000 a year. Dr Monaghan said: "It will be finished in terms of conservation in the next couple of months, the Mary Rose Trust have agreed to keep it until the end of 2011 and we're discussing with them whether they can keep it for a couple more years while we establish what we're going to do with the ship long term. "It would be very nice if it could be brought back to Guernsey, the chief problem is its size, it's 18m (59ft) long. There's no building that the Museums service has which is long enough to put it in. "So we have to find a building, we have to convert the building, we have to build a glass showcase to put the ship in with a bit of environmental controls to keep the humidity stable. "Then we have to build effectively a museum gallery around it in order to make it interesting for the general public who don't know anything about Roman ships. "So we display the artefact beautifully and then we interpret it for locals, for visitors, for school groups so that they can understand what they are seeing so they see how it fits into ships in the Roman world and how Guernsey fits into the Roman world as well."